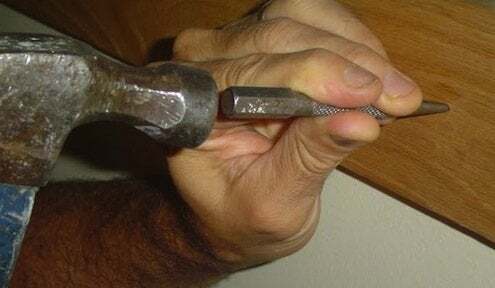 If you have stubborn nails that pop out of your floorboards, or you need a way to get a finishing nail flush against the surface without damaging the wood, what you need is a nail set. A nail set is a small tool that looks a bit like a nail, but thicker, with a rounded point on one side and a flat end at the other. You can use it to tap a nail in that last quarter inch without whacking the finished surface with your hammer. Finish nails usually have little depression in their heads that allows you to position a nail set without having it slip out as you tap. You can also use a nail set on woodworking projects that will be painted or stained. Use it to push a nail below the surface, then fill in the gap with wood filler. Finally, you can use a nail set to fix a pesky nail pop, when an old nail rises from a stair tread or starts sticking out of woodwork. The nail set lets you fix the pop without leaving a hammer-shaped dent in the wood.